Learn more about our solutions on the basis of selected projects. Experience the 360° comprehensive project solutions live with different opportunities. Get an overview of the most important systems and products. Häfele optimizes the interplay of functionality, design and cost-effectiveness for your project. 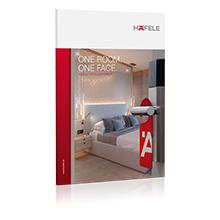 You can create intelligent solutions for any project with the systems and products from the Häfele product range. By doing this, you are putting your faith in a partner with international experience and a high degree of advisory experience. Find current project news and reviews of trade fair events in our press area. We are demonstrating the Häfele 360° comprehensive project solutions with specific solution examples using eight special construction projects. The Häfele bathroom mirror transforms every bathroom into a spa quickly and easily. The product unites the functions of make-up light, room lighting, mood lighting, demister and sound system in an elegant design.